A little over a year ago, when the Woodsboy turned 5, I bought him his first knife. While this may seem too young an age to some people, I think this is largely a 1st-world viewpoint. 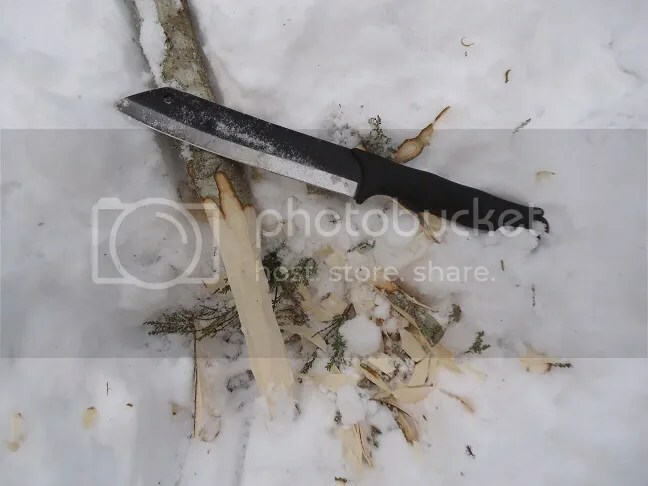 From evidence I have seen, children in rural areas of developing countries and tribal societies around the world are accustomed to using knives at even younger ages. 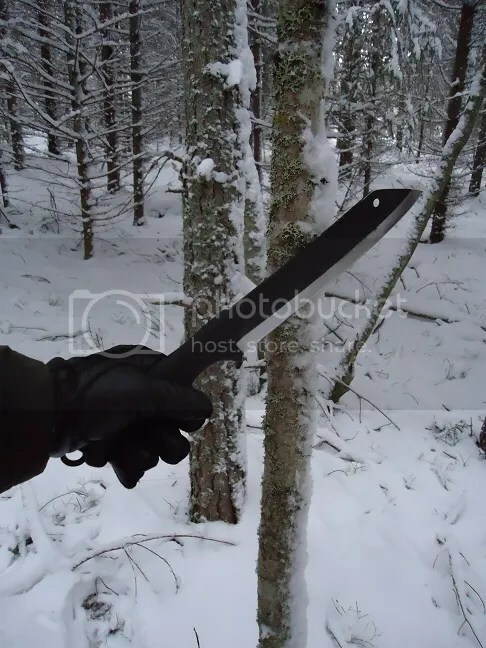 It’s true that this is largely out of necessity, as they don’t live in a world full of pre-packaged, store-bought items, but the simple fact is that they would not be allowed to handle knives like this if they were not capable of it. So under constant supervision, with safety always in mind and with a clear set of ground rules (e.g. 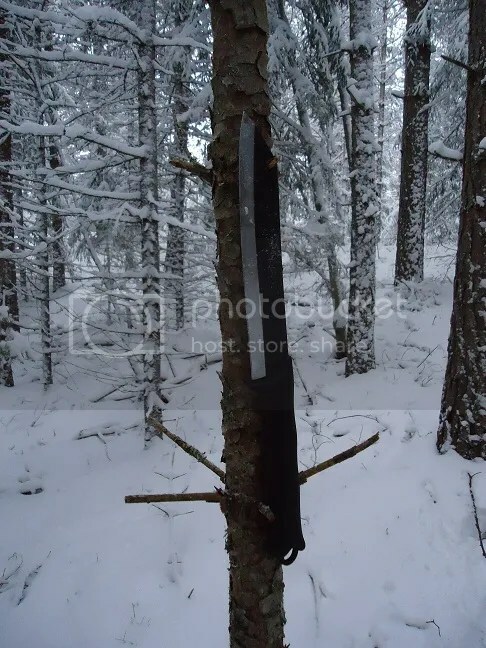 always cutting away from himself, always returning his knife to its sheath when not in use, only cutting things Daddy lets him cut, letting Daddy keep the knife in a safe place when we’re not practicing with it etc. ), I have begun teaching the Woodsboy how to use his first knife. So far over the past year or so we have used the knife together about half a dozen times, and our use has been centered around safe handling, as well as getting to know how the blade works and how to cut effectively. 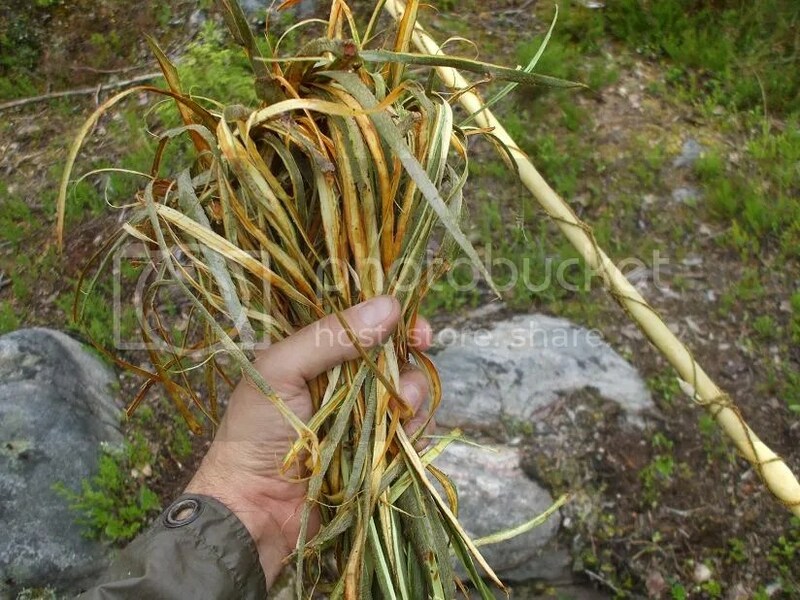 Most of what we do is cutting sticks, whittling and cutting string. 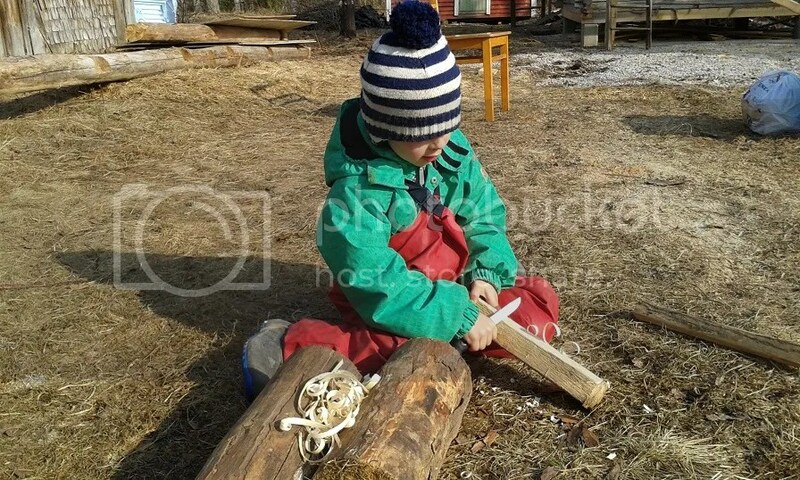 As he gets older and progresses, we’ll work on wood carving and other things like that. 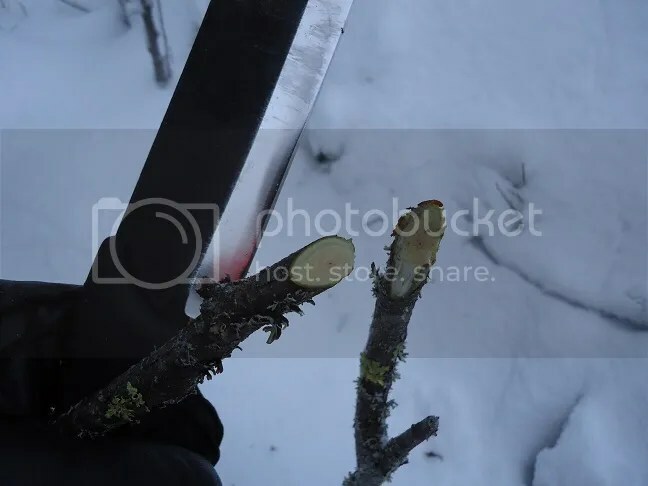 I’m happy to say that the Woodsboy has never come close to hurting himself with the knife and am proud to see that he handles it in a safe way (praise for good behavior goes a long way!). If you are looking for a starter knife for a child, I highly recommend the Marttiini Condor Junior or a similar knife with the same level of quality and safety features. The Condor Junior is a solid, well-made knife which should serve my son well for years (BTW, the tip can be ground pointy later on when he is mature enough and can begin carving with the tip). DISCLAIMER: Utmost care is necessary when allowing children to use bladed tools. They should NOT be left unattended. 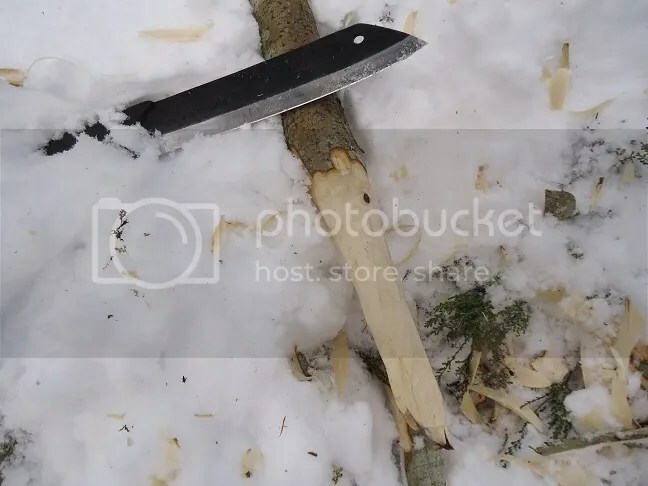 You alone as a parent/guardian are responsible for deciding whether or not your own child is old/mature enough to handle bladed tools and for teaching and supervising them. A few posts ago, I gave you my initial impressions of the Skrama knife from Varusteleka. 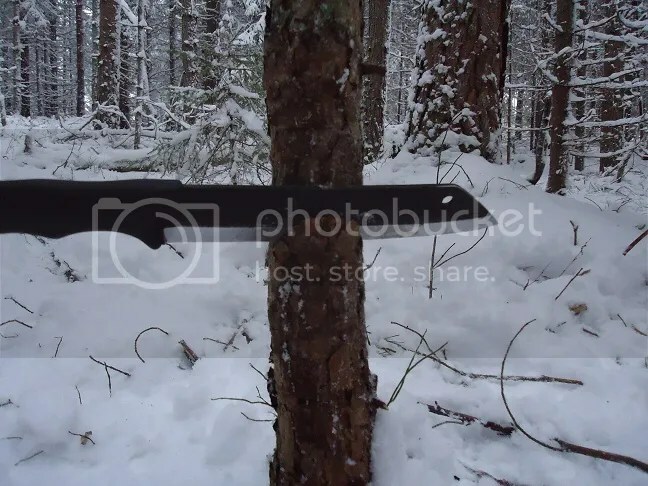 Cutting tomatoes and paper is all well and good, but it’s not a useful indicator of what an outdoorsman’s blade can do, so I drove out to the country the first weekend of December to do some real winter woods testing of the Skrama. 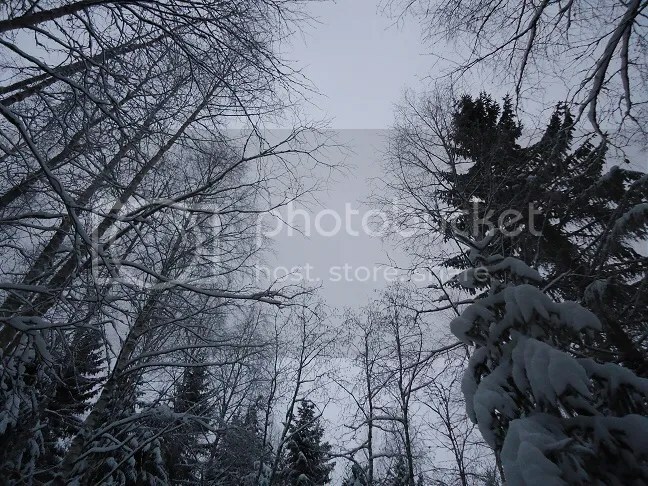 The temperature was about -3°C/26.5°F that Sunday. Not exactly a frigid North Pole winter day, but below freezing nonetheless. 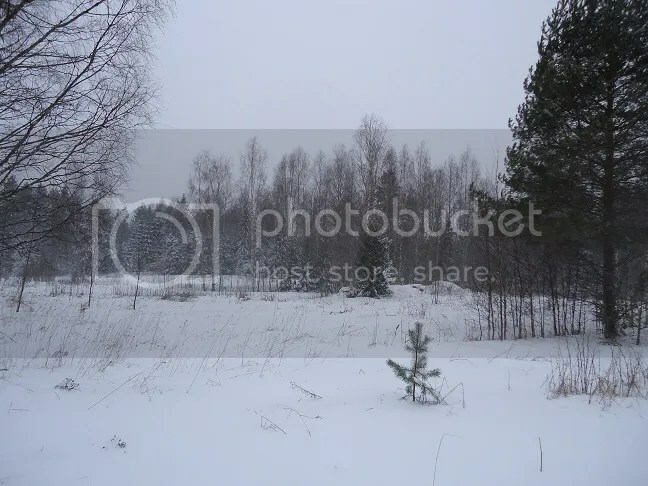 The scenery around the property invited me to photograph it, so I’ll show you some of my surroundings first. Once I had found a good spot to do the testing, I put down my pack and took out…unleashed, if you will…the Skrama. 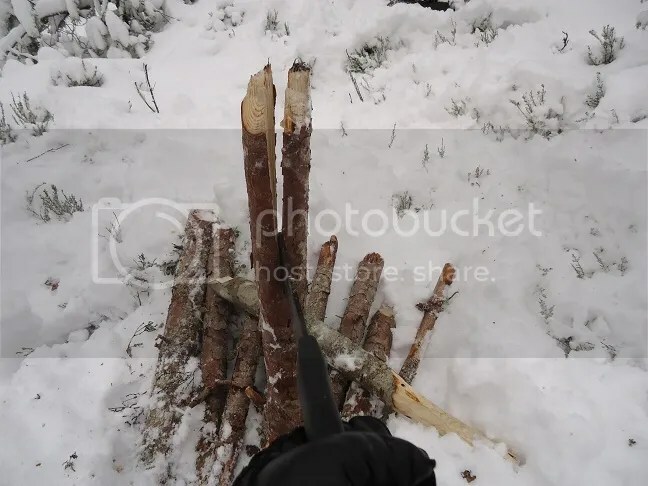 😉 I decided to test its chopping abilities first and located a live hardwood sapling and dead pine sapling for the tests. 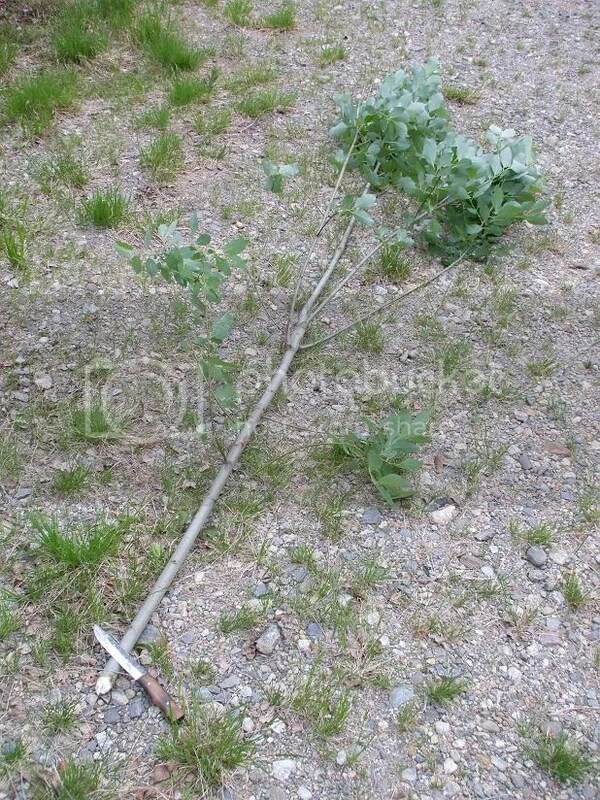 The live hardwood sapling fell after six easy blows. 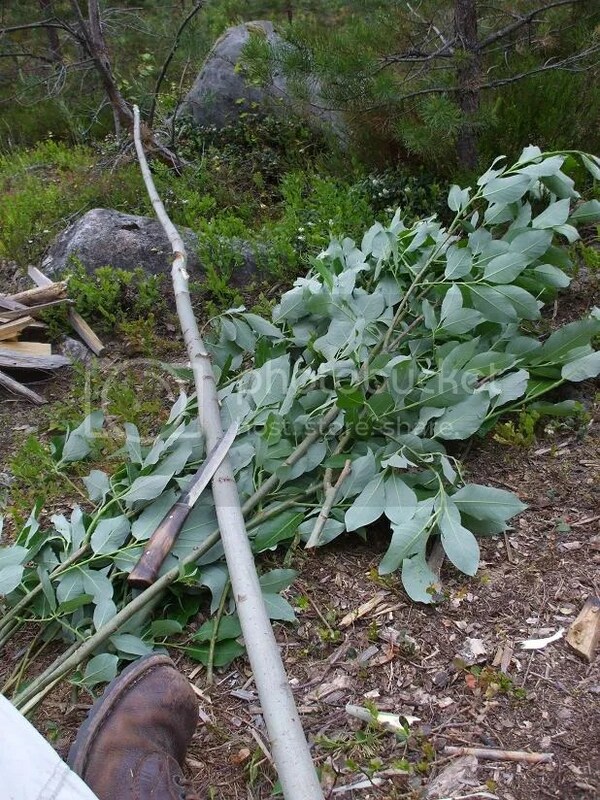 The dead pine sapling took a few more swings, on account of its being seasoned and hard. I liked how the blade cut deep without using excessive force. 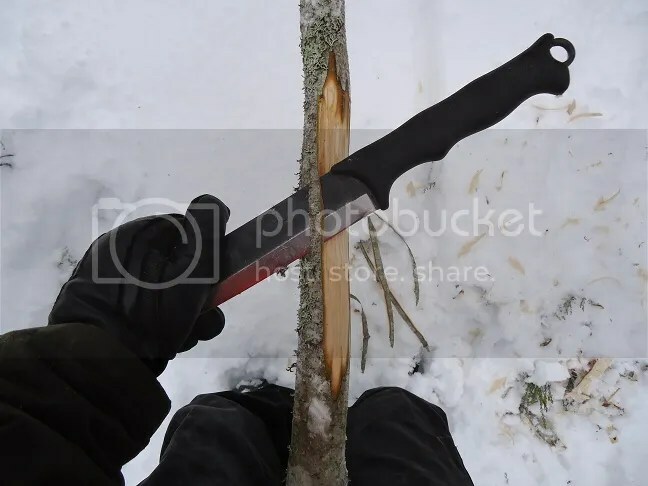 I found that I naturally choked all the way down on the handle for this heavier chopping and preferred to chop with the middle of the blade. At no point while chopping was there any uncomfortable vibrating of the handle which can occur with some large knives. 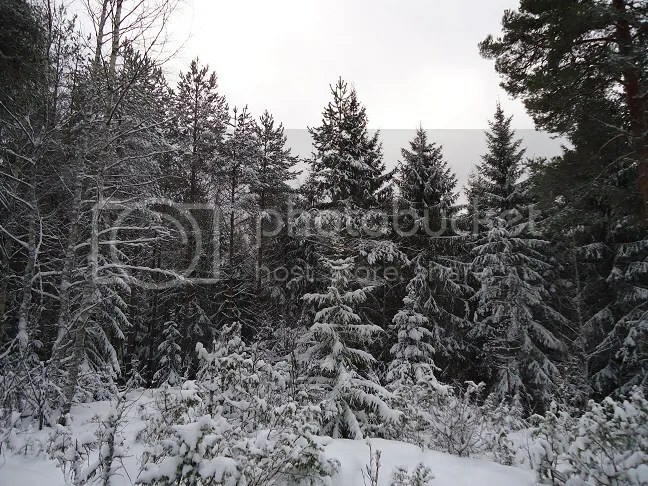 After chopping down the saplings, I dragged them to an open spot on a small hill to continue my testing there. 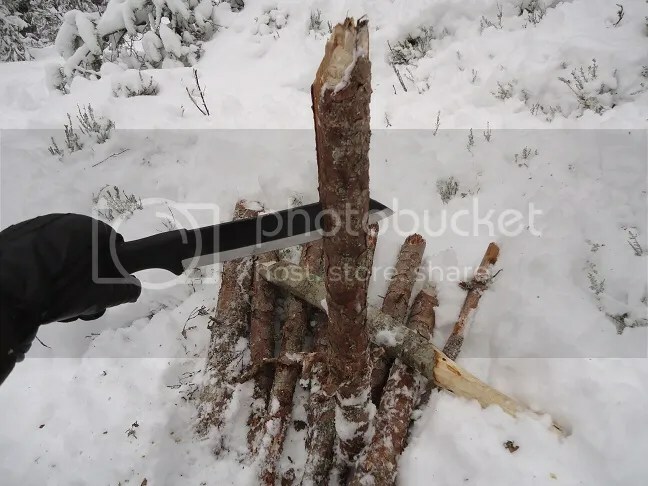 I wanted to turn the pine into firewood, so I sectioned it into manageable pieces with the bush knife. Three or four chops around the circumference and a swift kick were all that was needed to break off each piece. 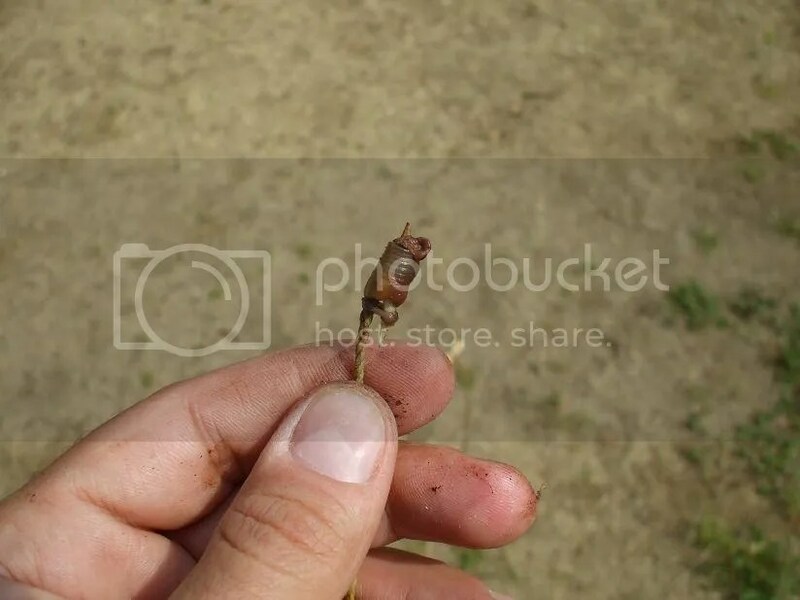 The thinner pieces broke off without a kick. 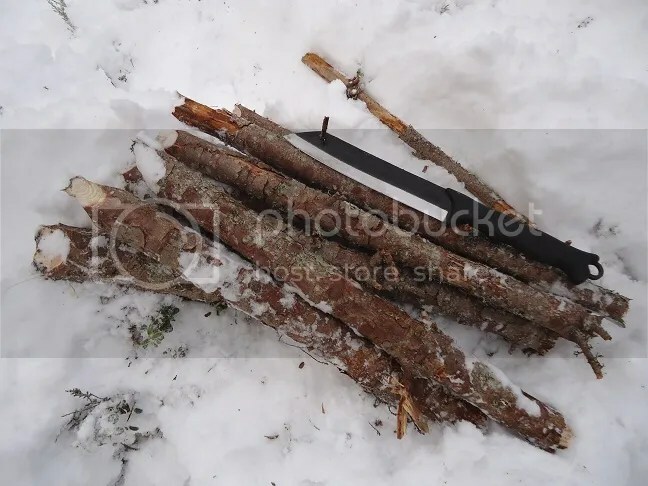 The next step in my firewood prep was splitting, but instead of using just another section of the pine to split with, I thought I’d use the Skrama to make a baton out of part of the hardwood sapling. After chopping off a section, I choked up on the handle to just below the blade and used light, controlled blows to carve out a handle. The great balance of the knife made it easy to be very accurate while doing this light chopping. Then I whittled the handle down a bit further to smooth it out. 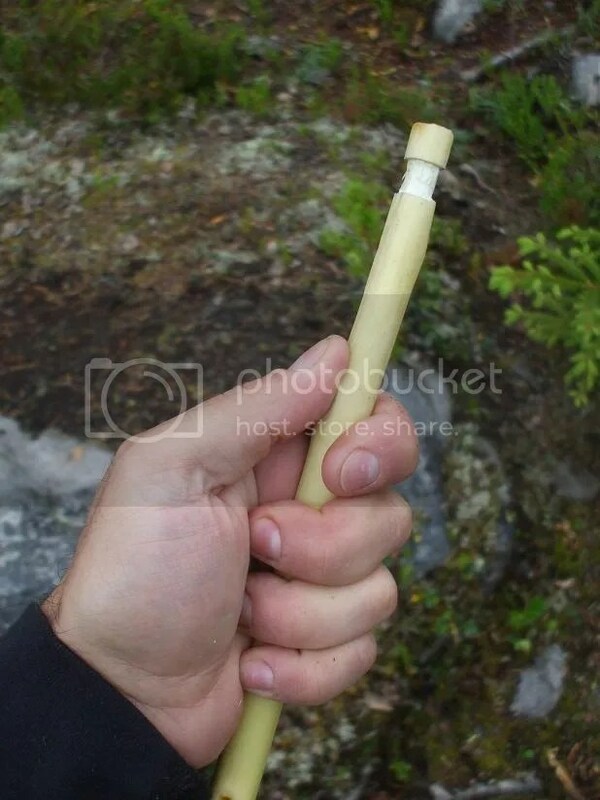 The Skrama is obviously not a carving knife, but it’ll do the trick for “camp implement” carving. Now that my baton was ready, I could commence splitting. 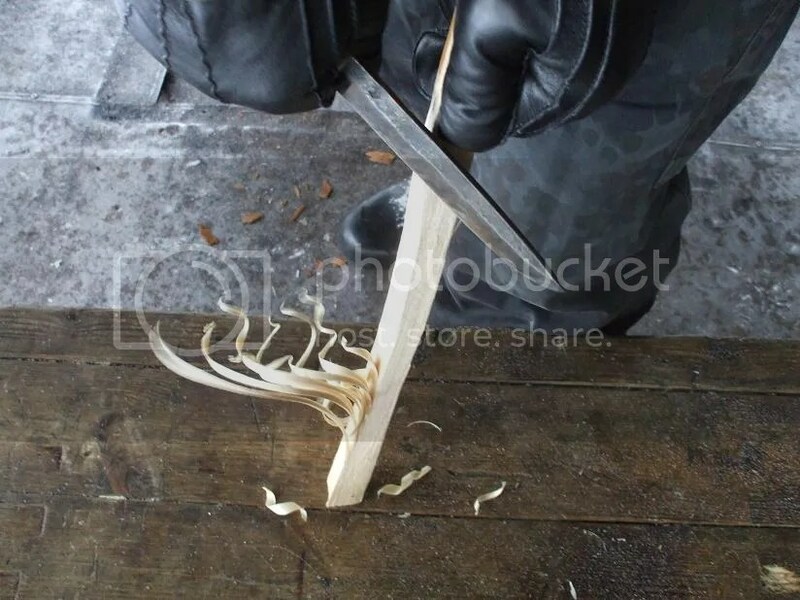 I was very pleased with how readily the blade went through the wood, and the knotty section at the bottom barely slowed it down. I liked that I didn’t have to be afraid to beat on the knife while batoning, something you have to be careful about with less-robust knives. The final step in one-stick fire prep (for me), is to make shavings/feather sticks, so that’s what I did. As you can see, the Skrama got the job done well enough. Again, fine work is not something I’d want to do all day with this knife, but to be honest it’s not really built for that anyway. It’s good to know that it can do it, though! 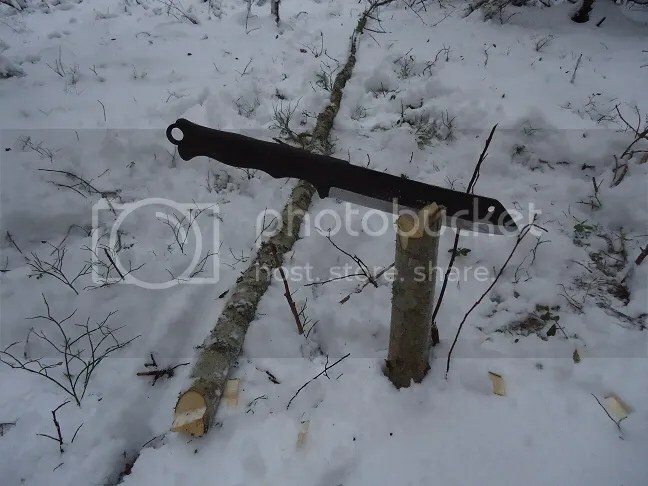 Out of curiosity, I experimented with this blade as a drawknife of sorts for removing bark from the hardwood sapling. It excelled at the task. 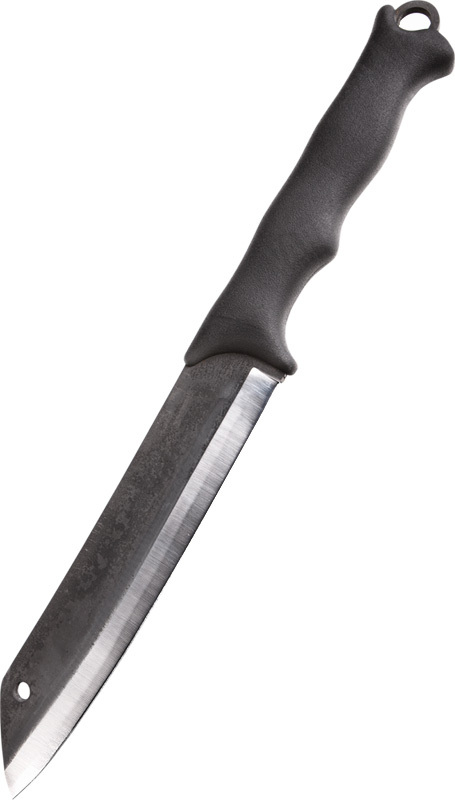 Being a large-bladed knife with a long handle, the Skrama is just begging to be used for slash cutting/machete work, at least in my mind. 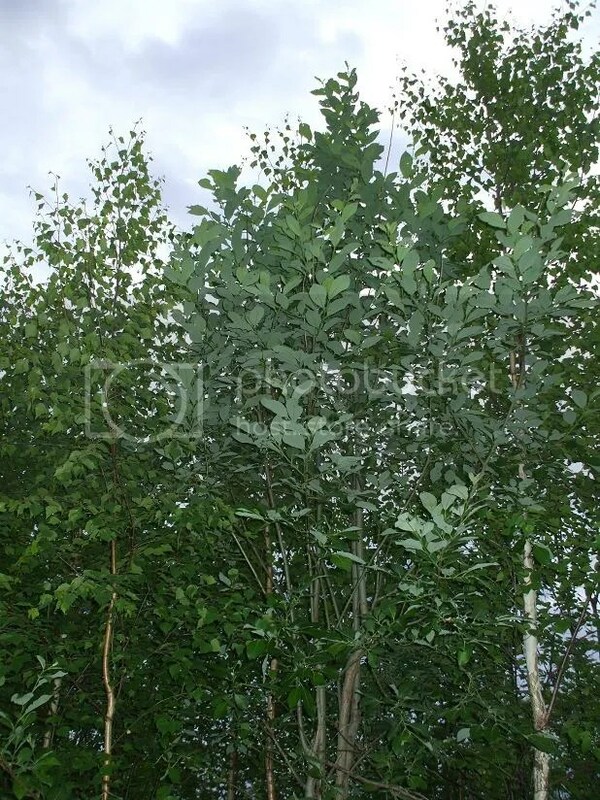 I dispatched a few hardwood seedlings in the area with one easy swipe each. I know which tool I’ll be using next year to clear the willow seedlings and saplings from the fields on the other part of the property! My final test of the day was going to be some finer carving using the tip of the blade. I came up with an idea for a cooking rig and started working on it when a photo blogger’s nightmare came true: My camera died. Not just the battery, but the camera itself. When I turned it on, the telescopic lens would not come out. Well, that was that for picture taking. I made an “arrow nock” in the end of a large forked stick, and the tip of the Skrama pretty easily handled the finer work for this end notch. Before putting the knife away for the day, I quickly checked to see how the edge had held up. It was still surprisingly sharp, though I might touch it up a bit if I want to cut any more tomatoes with it. 😀 I think this shows that Varusteleka/Laurin Metalli did a very good job with the heat treat and sharpening of the knife. 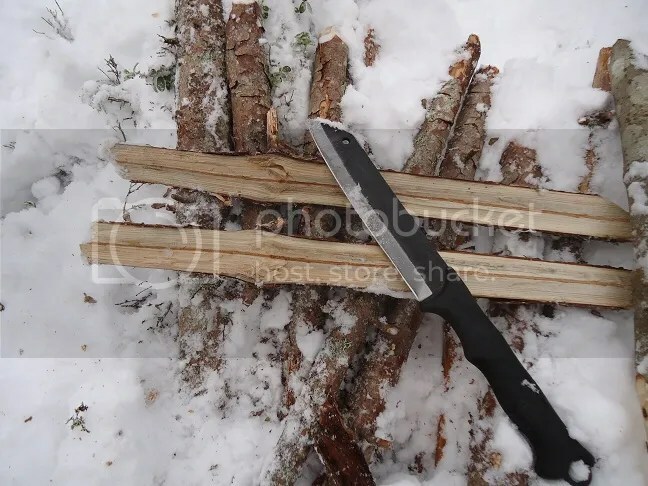 The Skrama is a great chopper of both seasoned and green wood, splits and slash-cuts impressively and can do finer work as well, though I’d probably want to pair it with a much smaller knife if I have a lot of smaller work to be done. The handle does allow for a variety of different grips and holds, which aids in the knife’s versatility. One thing I was surprised about while using the knife was that there was little need to “get to know” the knife, in other words, to work with it for a while to figure out how to use it best. This shows the thought and effort that went into its design. 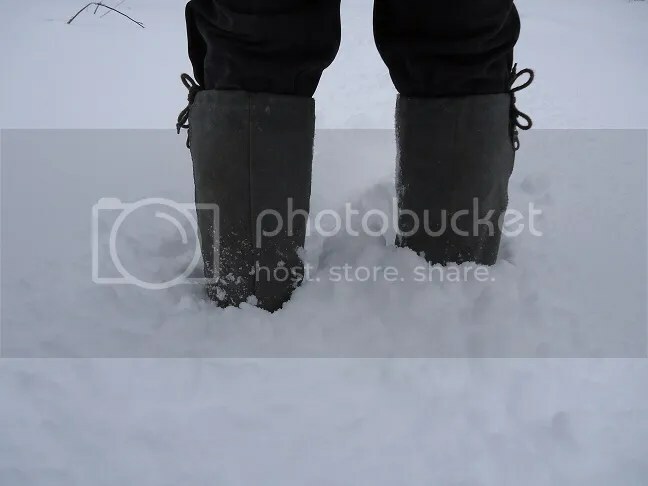 Because of the Skrama’s solid construction and materials, I was not afraid to use it roughly, toss it in the snow etc., and there was no danger of it slipping out of my hand thanks to the handle’s material and texture. By the way, this knife is full tang (the metal ring on the bottom of the handle is an extension of the tang). In my opinion, the Skrama lives up to its claims as being a rugged, multipurpose wilderness blade, and then some. I would not hesitate to recommend this knife to someone looking for a solid tool for a variety of uses and situations. 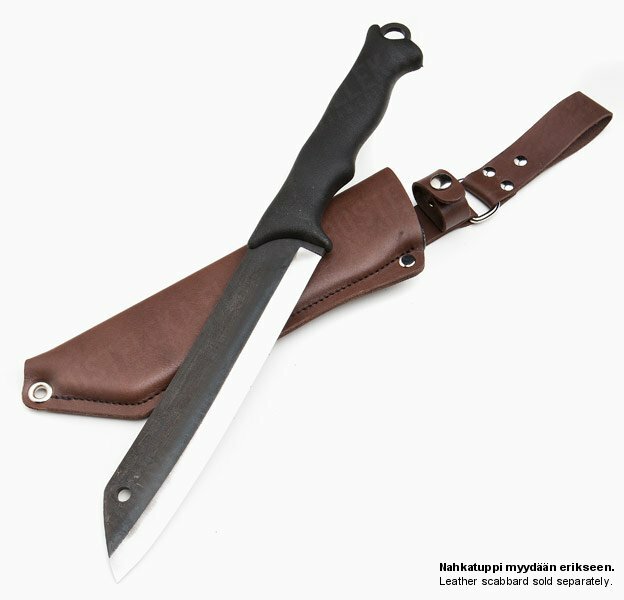 While collecting info on the Skrama, I went back to Varusteleka’s website and saw that the leather sheath they designed and make for the knife is now available and that the knife itself is currently on sale for €55.25 ($75 USD) until this coming Sunday, December 15th. 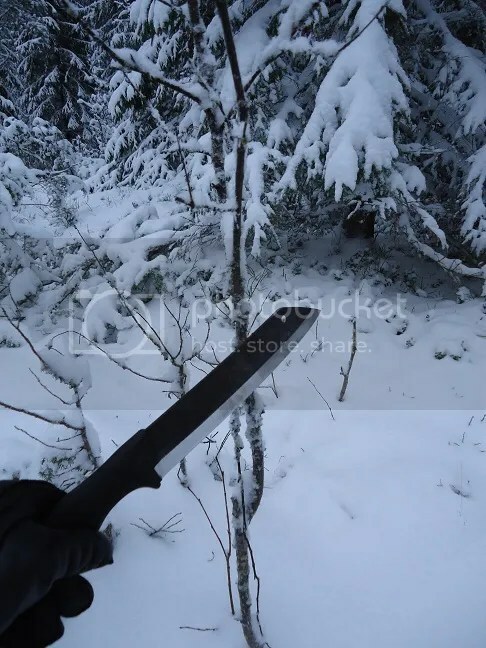 While perusing the website of Finnish outdoor and military surplus shop Varusteleka, I spotted a new knife of their own design which is now available: the “Skrama”. It looked interesting to me, so I decided to share it with you here. For the record, I don’t work for the company or anything like that, and this blog post was completely unsolicited. I’m just a satisfied customer who orders from them from time to time. 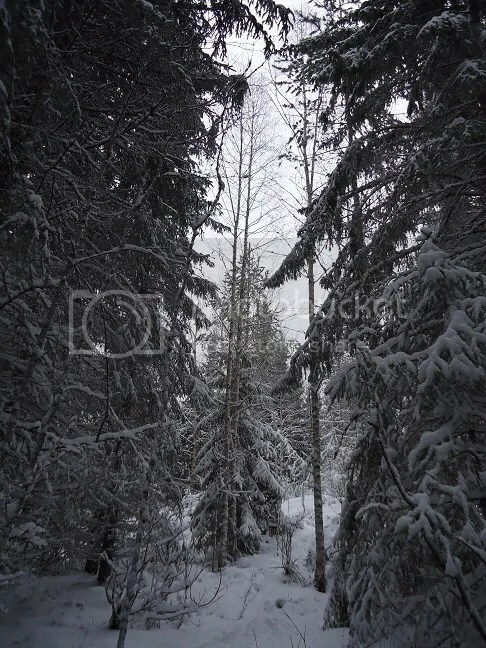 I’ll be leaving for Lapland in two days and won’t be able to update the blog while I’m gone. Stay tuned! 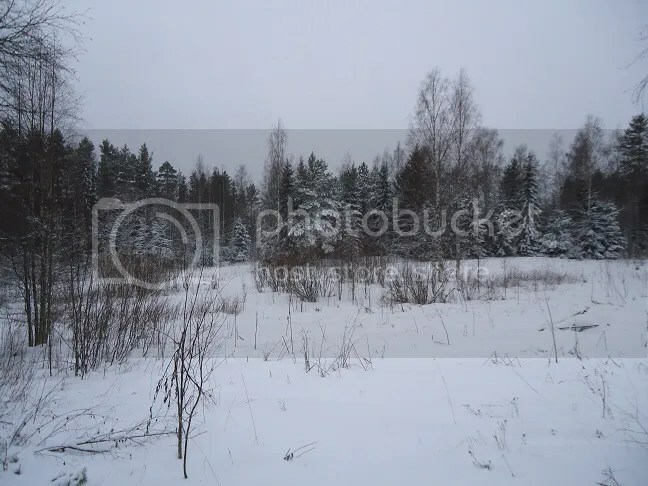 While working at my 9-to-5 job during the week, my mind has a tendency to wander (not infrequently in the direction of outdoor pursuits, as you may have guessed). 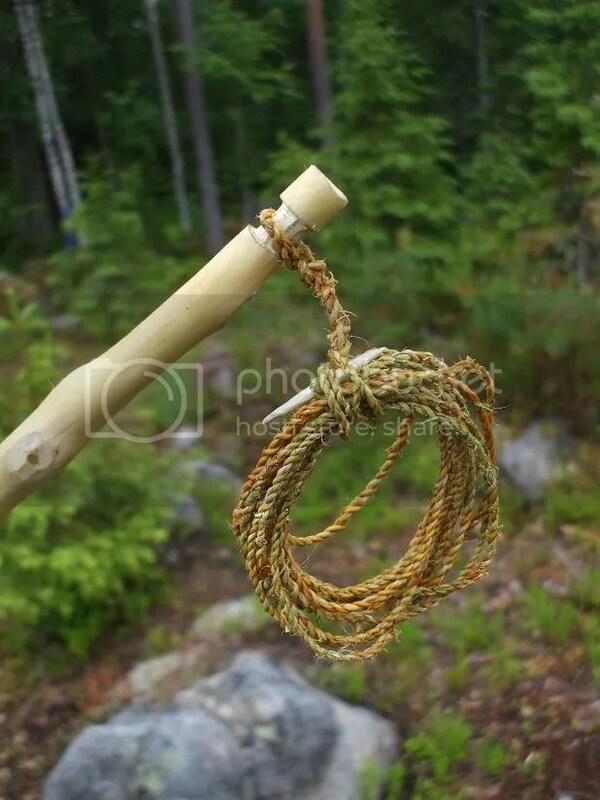 Last week, I got the idea of making a functional primitive fishing rig from a single plant/tree using my camp knife as the only tool. 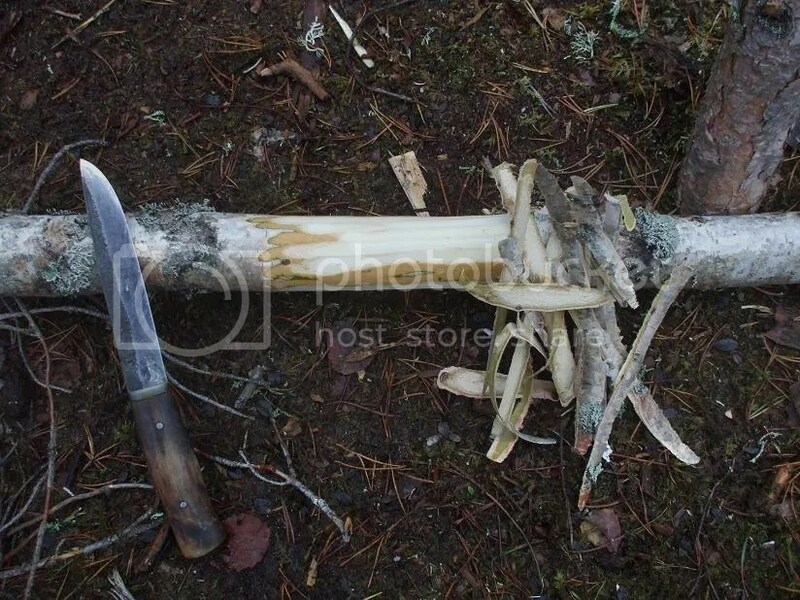 I thought this would be a good way to put some basic primitive/bushcraft skills to use in a practical application. When the weekend rolled around, I hit the woods to see what I could do. Before I get into it, let me say that this project was based on my limited knowledge and experience, as well as the resources available at the time and place. There are probably many different (i.e. better) ways to approach this! 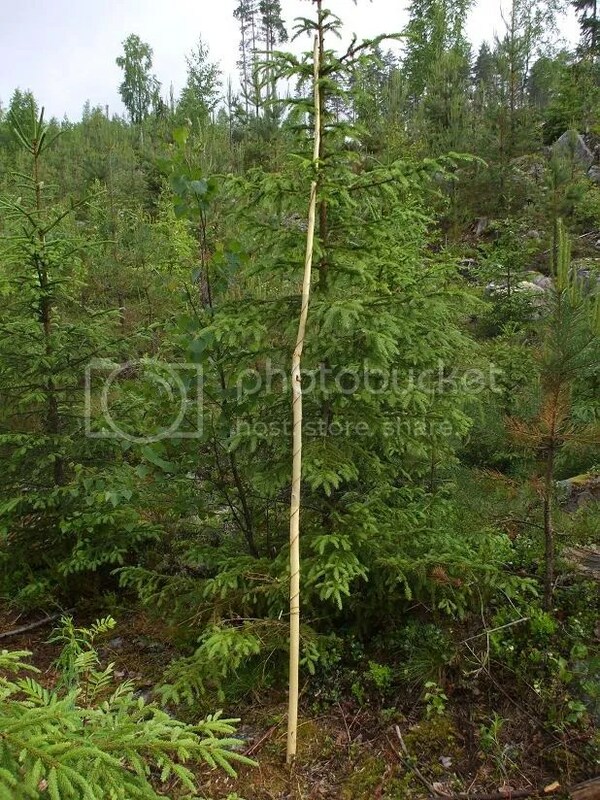 The plan was to first find and harvest a willow sapling/branch. 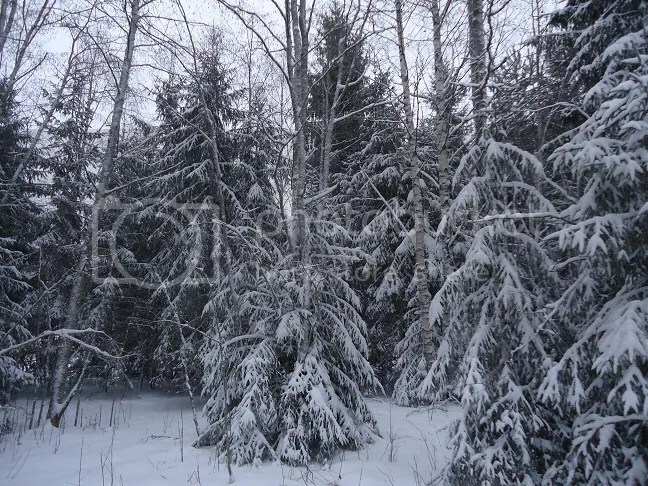 Then cut off the branches. 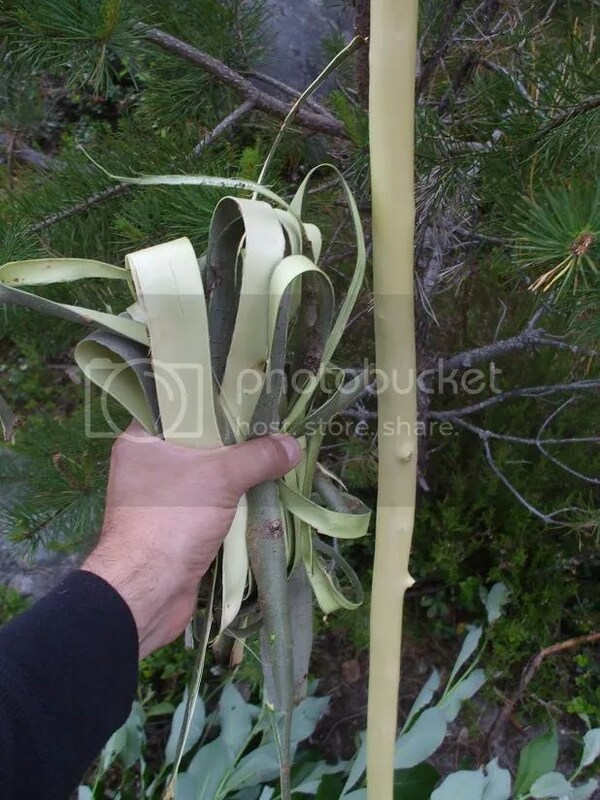 Slit the bark from top to bottom and remove it (this is most easily done in spring/summer). Then split the bark into thin strips. 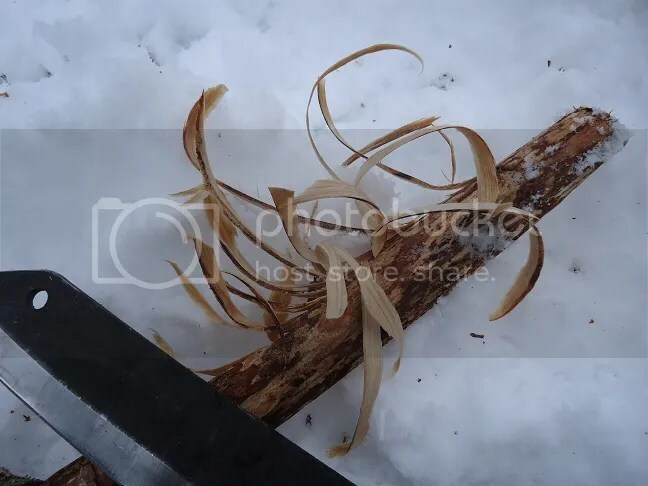 At this point, I would normally scrape the green outer bark off the white inner bark and then boil the inner bark for a while with the outer bark scrapings and some wood ashes added to the water. I didn’t have time for all this, though, so I only scraped off most of the outer bark. 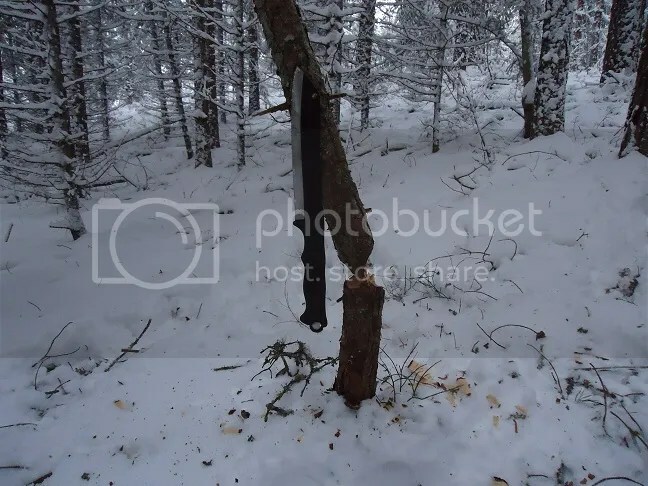 Next, carve a “gorge hook” from one of the branches. 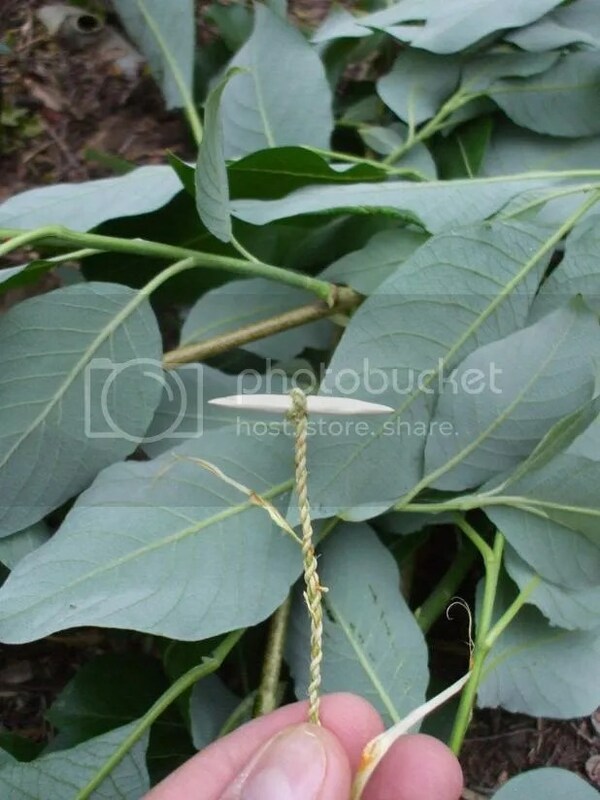 Then spend the next few months making several meters/yards of fishing line from the inner bark (see this post for info on making cordage). 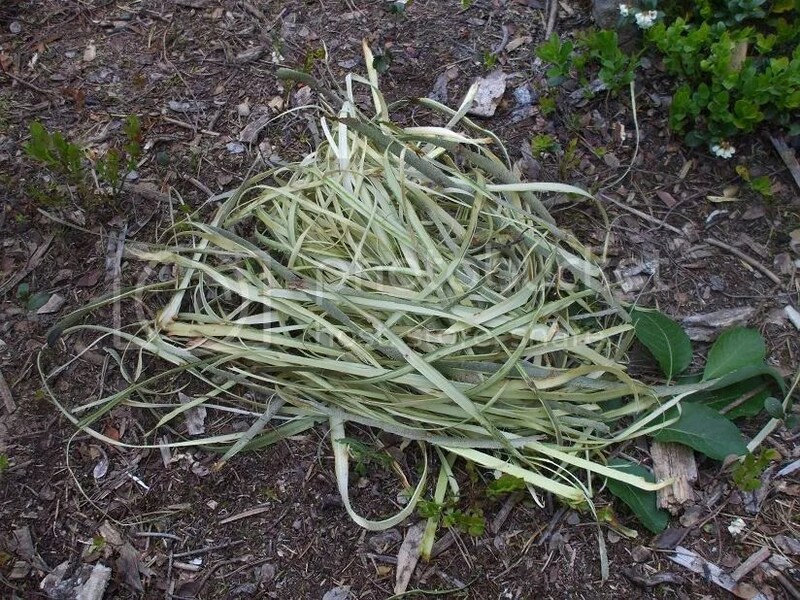 I should mention that willow bark cordage like this tends to dry out by the next day, so it should be processed further to keep its flexibility and strength (so far, I have tried both waxing and oiling, which seem to work well). Anyway, after getting the line started, slightly untwist the loop end, slip the gorge hook in and twist the line back again. Then untwist the next twist up the line and insert the hook in there as well, finishing by twisting the line back again. Eh, I’m not sure if I’m explaining this very well! Try to finish the line before it gets too dark or you lose consciousness due to a lack of blood, which the mosquitoes, black flies and gnats have been drawing from you for the past several hours. 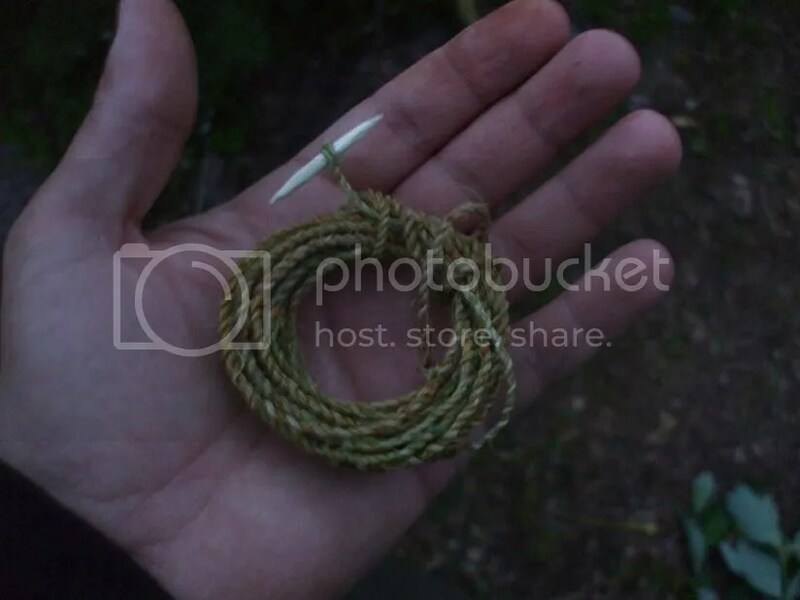 When I was finished, I still had lots of bark left over to make more cordage with. So far, so good. But the proof, as they say, is in the pudding, so it was time to see if it could catch a fish. I intentionally started with an overly large hook, figuring that I’d probably have to whittle it down until I got the size right. I took a small piece of bread and smushed it around the gorge hook and line, making sure the hook was nearly parallel with the line (yes, that is a mosquito in the shot; there were swarms of them around). 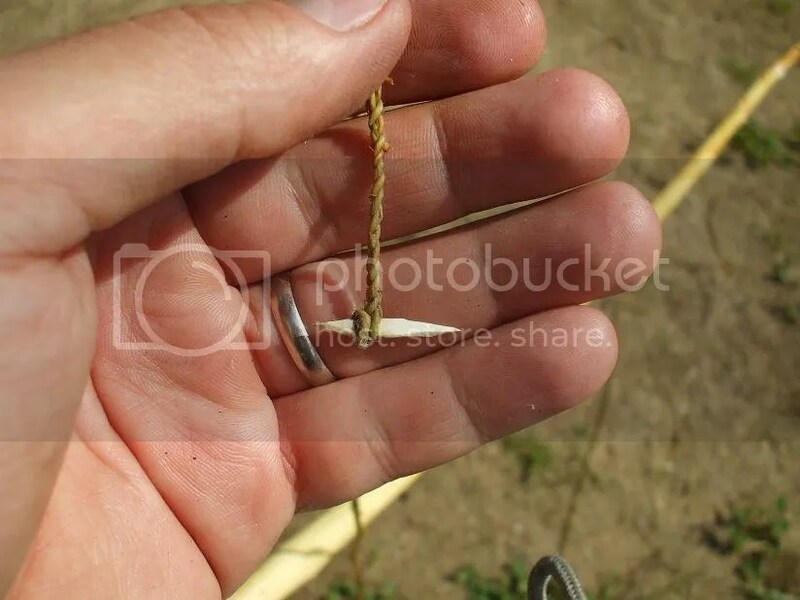 It appeared that the hook and bait were too large for the small fish to take into their mouths (I could see them in the shallow water), so I whittled down the hook. Having remembered that perch prefer worms over bread (though roach readily take both), I found a worm and used a piece of it. After making these changes, I was getting some serious bites! I was surprised by how sensitive and responsive the rig was. It was at this point that the project took a (hopefully temporary) nose-dive. Again and again, I could see a fish take the baited hook into its mouth and tug on it, but each time it would spit it out again. They just would not swallow it! 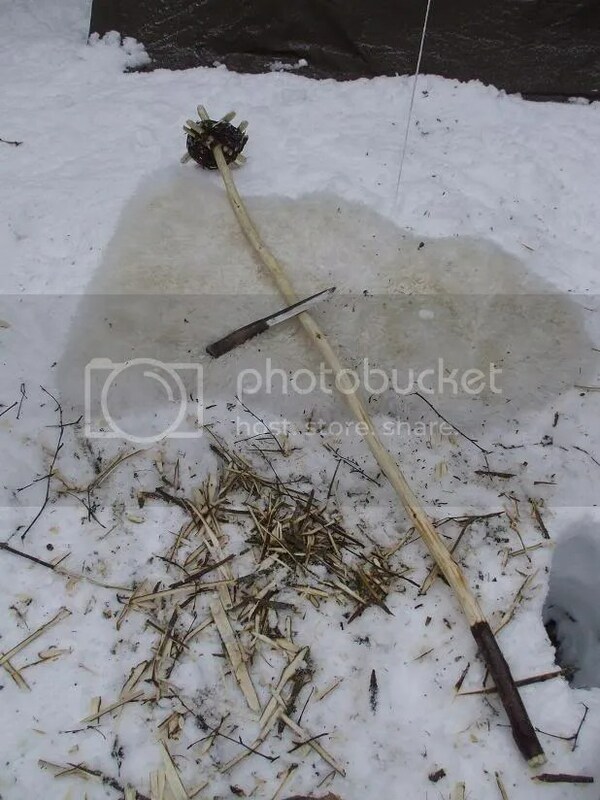 With this type of setup, as opposed to a curved hook, the fish has to fully swallow the sharpened stick so it gets stuck inside the fish (which, by the way, is why you should not fish this way unless you plan on dispatching and utilizing the fish). So why weren’t the fish swallowing the bait?! The reason, I suspected, was that the line was too thick and rigid. It gave the fish the sensation that they were trying to bite a piece off of something larger, but could not. As I said, I suspect this to be the reason. I’ve never tried anything like this, so only more trial and error will tell. The next day, I used some of the extra willow bark to make a much finer and more flexible leader which the fish will hopefully not detect as easily. Then I spliced it into the existing line and attached the hook (which, as you can see, I had modified further by blunting the short end). 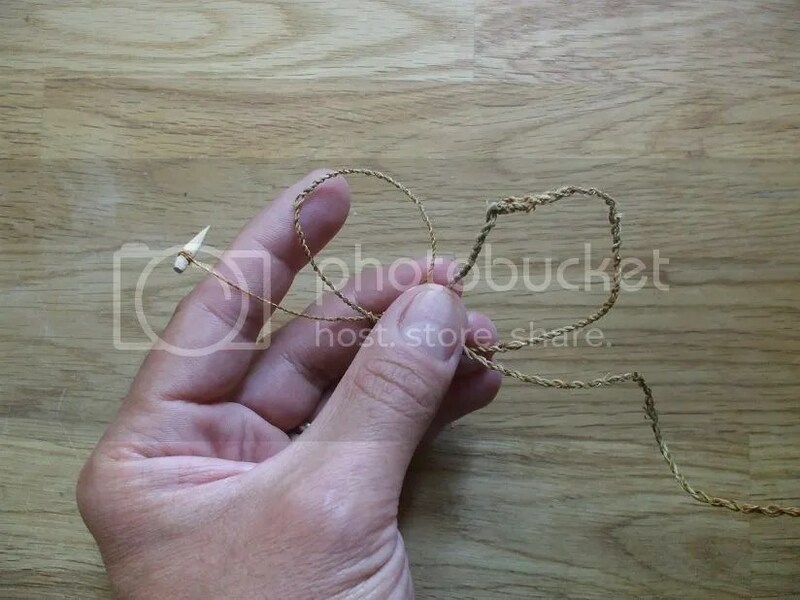 The splice point is the “left corner” you can see in the second loop. 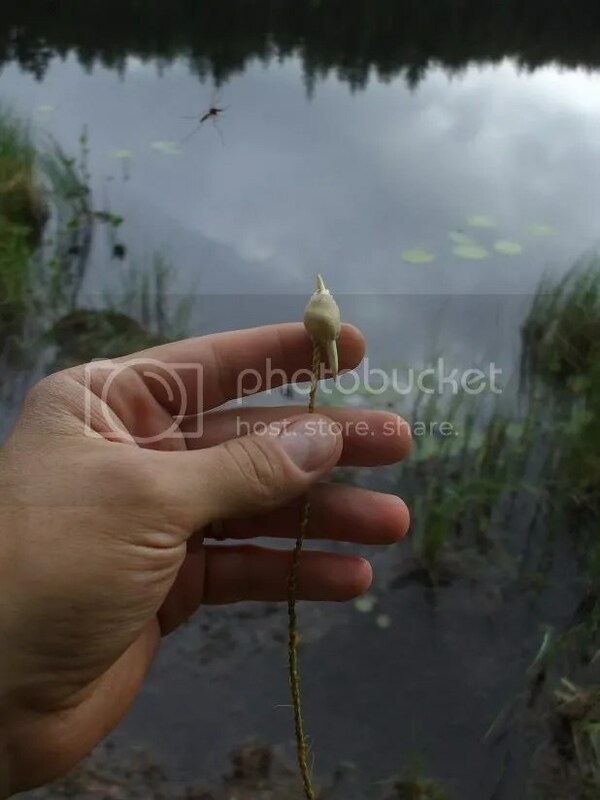 I will try the rig like this and, if fish swallow it, but the hook doesn’t catch, I’ll start over with a larger hook and whittle it down until it’s just right. My favorite knifemaker extraordinaire, Ilkka Seikku, who’s based in Sammaljoki, Finland, has recently put out a short video on his signature knife, the BushProwler. 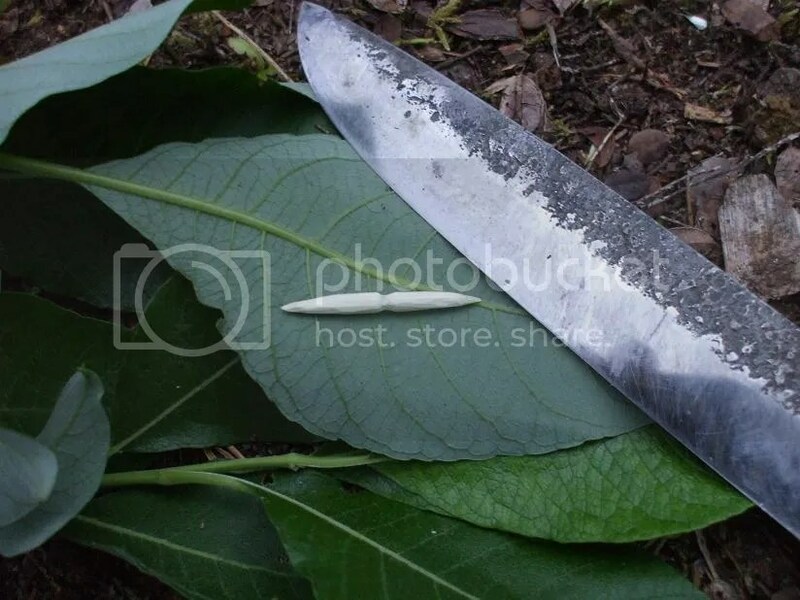 He briefly covers the knife’s specifications and materials and then demonstrates the versatility of this bushcraft/outdoorsman’s blade. Ilkka is backlogged for about a year and will start taking orders for knives again in June should you be interested in getting one. 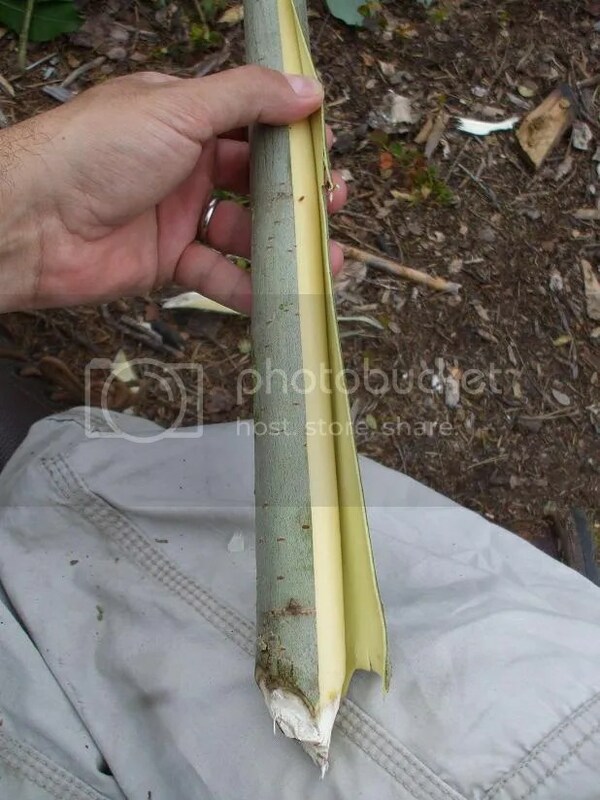 Shaving off green (fresh) birch bark. Processing stinging nettles for cordage-making. Cuttin’ up bacon for woodsman stew. This is only a fraction of the things I’ve used it for. It’s a real all-rounder! 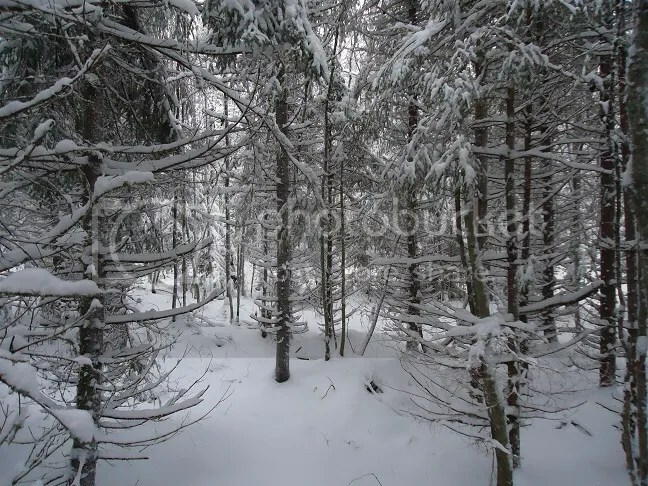 Sometime last year, Scandic Woodsman alerted me to an interesting vintage video on YouTube. 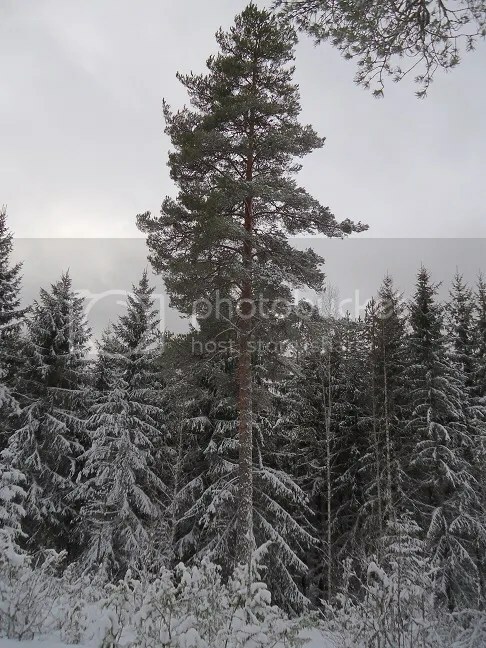 It shows a group of men building a log structure using only hand tools in the traditional Finnish way. Apparently, it was still very common for people to build their own houses in this manner well into the 1920s/1930s. The video below is in Finnish and doesn’t have subtitles, but it’s still very interesting to watch, in my opinion.